Summer vacation has never been this fun! Now part of the Accelerated Reader Program ! Join the Parkers, an intrepid family of four, as they adventure into the national parks. Nearly ten year old twins, Morgan and James, explore the natural and historic wonders of such destinations as: Bryce, Zion, the Grand Canyon, Yosemite, Yellowstone, the Great Smoky Mountains, Olympic, Glacier, Rocky Mountain, the Badlands, Wind Cave, Mount Rushmore, Arches, Canyonlands, Acadia, and Grand Teton. Along the way, the family meets other travelers, rangers, and colorful characters pertaining to each park. Adventures with the Parkers- a series for kids and families- is packed with action and excitement, as well as interesting facts about plants and animals, geology, the history of the parks, wilderness safety, and environmental and preservation issues effecting the parks. The books also offer tips and information on travel plans, great places top hike, ranger programs, historic points of interest, and much, much more. Each book in the series contains maps and full color photographs that represent a possible family's journey. The books are realistic fiction- everything that the family experiences could happen in real life, or maybe did happen to someone and the details were changed to fit the characters. The Parkers books are a great way to get to know the national park you are planning to visit, or they also make a perfect souvenir for your stay in the park. Either way, you'll have a fantastic outdoor adventure with you wherever you go while reading these books. "The Adventures with the Parkers books are just remarkable and we are enjoying them immensely. Our family has been lucky enough to have been able to travel to each of those 12 parks in the series. Reading each of the books is like going back for another visit. They include the history of the places, the wonderful things found there, and wonderful pictures. They are as enjoyable to me as an adult as they are to our grandchildren. We can't wait for the next Parker adventure! Thank you for hours of enjoyment." Join the Parkers as they embark on their first national park adventure. Twins, Morgan and James, explore the natural wonders of Bryce and Zion, journeying among the hoodoos and sleeping beneath the stars. But the trip takes a turn for the worse in the treacherous Zion Narrows- can they rescue Dad from a dangerous fall? In this installment of FalconGuide's Adventures with the Parkers series, the Parkers journey to Acadia National Park in Maine where they explore the beautiful coastal waters and hike many of the park's finest trails, including to the top of Cadillac Mountain, the first place in the U.S. to see the sun rise every morning. They decide to end their trip by camping on an island within the national park, but when Mom tries to kayak back to the mainland, she gets beached on a remote island--and quickly discovers she is not the only one stranded there! "After a long flight from California, the Parkers are ready to see all the sites of Acadia National Park. With the guidance of the park rangers, the Parkers hike several challenging trails, bike the old carriage roads, watch the local sea life, explore nearby islands, and snack on wild blueberries growing all over the park. During their excursions, Mrs. Parker joins an old college friend to kayak around several of the islands. However, their kayaking trip is interrupted when the two friends come across a young beached whale. In the eighth book in the Adventure with the Parkers series, the Parkers visit Glacier National Park in Montana. As they enjoy the waterfalls and uniquely sculpted mountains while the park's glaciers glimmer above them, the Parkers learn that because of global warming, the glaciers may not last that much longer. During their family hikes they encounter a lot of wildlife, including moose, mountain goats, and grizzly bears, but the smoke and flames of summer fires may thwart their vacation plans. Will Dad be able to bike over Going-to-the-Sun Road in celebration of his fortieth birthday? The Parkers hit the trail once again, this time in Yosemite, one of the country's most popular parks. In Yosemite, James and Morgan take in the beauty of the sequoia trees, hike alongside waterfalls and even attempt an ascent of the cables. Will they make it to the top of the infamous Half Dome? In this adventure the Parkers journey to southeast Utah to see the "Land of Standing Rocks" and such prominent features as Delicate Arch, Landscape Arch, Park Avenue Skyline, the Needles, and much more. They encounter mountain lions, a dive-bombing blue jay, and wicked desert weather along the way, but it's not until James makes a surprising discovery that they really connect with the region's colorful history. In the seventh book in the Adventure with the Parkers series, the family heads to Colorado to visit the high peaks of Rocky Mountain National Park. When the snow clears, the parks many famous sights are on display: Trail Ridge Road, spectacular wildflowers, elk, waterfalls, and unique alpine tundra. The family's big adventure? A hike up Longs Peak, a Colorado "fourteener." But afternoon storms begin to pelt the family during their training hikes, and they begin to question the wisdom of a nighttime summit ascent. With their great-grandfather's journal as their guide, Morgan and James head east to the most visited national park in the country: the Great Smoky Mountains. The twins and their parents backpack twenty-six miles along the Appalachian Trail, learning the park's unusual history and experiencing its amazing diversity- spotting both the synchronized fireflies and the world's largest salamander. But will the adventure end when Morgan comes down with a mysterious illness? Take your kids on an adventure with the Parker family to Sequoia and Kings Canyon National Parks in California. Sequoias are the largest trees in the world- imagine a tree that's one and a half times bigger than a Boeing 747! And it grows from a tiny seed the size of an oatmeal flake! How does a sequoia grow so big? 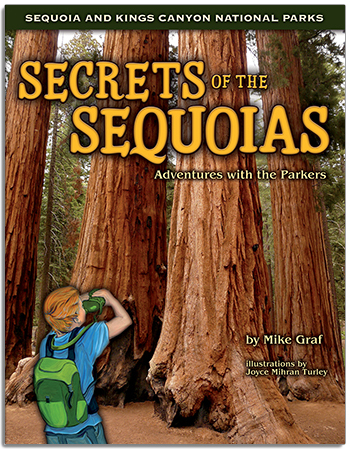 Tag along with the Parkers- twins James and Morgan and their parents - and learn all about sequoias as they hike among the giant trees, explore dark caves, scramble up huge granite domes, and cool off in the spray from amazing waterfalls. They even climb to the top of 14,494-foot Mount Whitney, the highest peak in the lower forty-eight states. There's a new adventure at every turn, from encountering black bears to meeting an old man who lives in a giant log! Lace up your hiking boots and join James and Morgan as they uncover the Secrets of the Sequoias! The Parkers are back for another adventure in the Grand Canyon. Morgan and James brave a steep twenty-one mile hike from rim to rim. As they face heatstroke, exhaustion, and even a run-in with scorpions, they wonder, "Can we make the grueling climb to the top?" Join the Parkers as they explore the wonders of America's first national park, Yellowstone. While in Yellowstone, Morgan and James marvel over the geysers, thermal pools, and the vast array of wildlife. But when they come face to face with a grizzly, what will they do? In this latest installment of FalconGuide's Adventures with the Parkers series, the Parkers journey to Grand Teton National Park. While there they see moose, grizzly bears, elk and other animals while hiking the Teton Crest Trail, one of the most beautiful backpacks in the country. But when the parents hire a guide and attempt to scale the Grand Teton, things get dicey in the extreme mountain environment. Will they make it safely to the top--and back down again? Join the Parkers as they journey to Olympic National Park in the Pacific Northwest, where they explore the tide pools along the coast, hike through Olympic's dense rain forest, and experience the famed alpine scenery and immense glaciers. Treacherous mountain terrain could stop them in their tracks. Could it prove to be ultimately too dangerous? This Teacher’s Guide is meant to give direction to teachers who want to use the Adventures with the Parkers books as part of their curriculum.